Can Dogs & Cats Eat Seaweed? We feed our pets different things for different reasons. Maybe your pet eats a seafood-based kibble, like salmon or whitefish, because it helps regulate his digestive tract. Maybe you feed strictly grain-free, like all Supreme Source® food, because you’ve noticed an improvement in your pet’s skin and coat. Pets’ nutritional needs vary, and they react uniquely to specific ingredients and types of food. Allergies can also affect our pet’s digestive system. Some ingredients, like corn, wheat, soy, and grain, can cause an upset stomach. Seaweed is easier for pets to digest, and may help firm their stool, regulate their digestion and improve their metabolism. 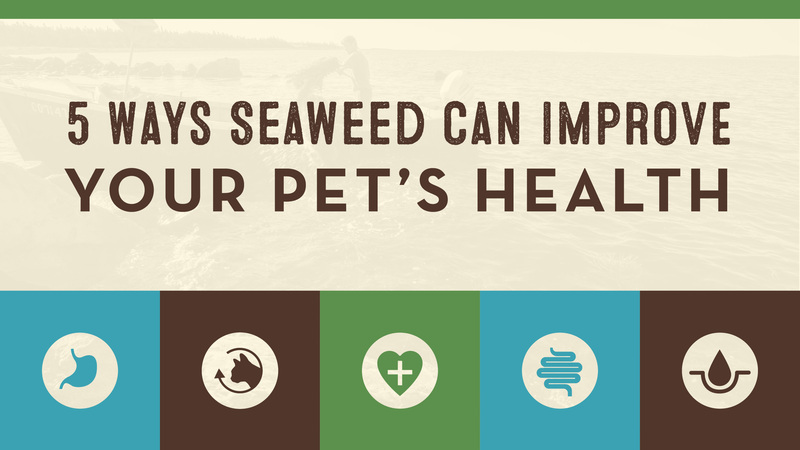 If your pet is affected by stomach sensitivity, talk to your veterinarian about adding seaweed to his diet. The ingredients found in Supreme Source include blueberries, carrots, parsley, cranberries, pomegranate seeds and now, seaweed. Like these fruits and veggies, seaweed is loaded with antioxidants, so Supreme Source is powerfully nutritious with every bite. Antioxidants aid heart health, which increases longevity and may lower risk of infections. What promotes healthy bowel movements plus contains anti-inflammatory, anti-tumor and anti-rheumatic properties? The answer is fiber, a nutrient which both humans and pets need. To maintain intestinal health, a daily dose of fiber is important, which you can find in seaweed. In addition to fiber, seaweed is full of prebiotics which help sustain good bacteria in the gut. Many pets suffer from allergies, specifically to grain, corn, wheat and soy, which can affect their skin. Grain-free food is known for its soothing skin and shiny coat properties, and the addition of seaweed may help your pet even further. Supreme Source with seaweed may help reduce skin dryness, redness and decrease inflammation. It should go without saying – when you eat well, you feel well. Seaweed is considered a superfood because of its many health properties that positively benefit our pets. We’re confident that a diet with superfoods will better your pet’s health, which is why all our grain-free food now contains seaweed. Find Supreme Source at a grocery store near you.